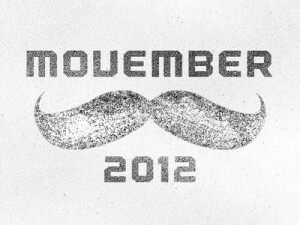 Movember? What’s that, you’re probably wondering? Well, it’s the month in which certain men choose to grow out and show off their moustaches to raise awareness and funds for prostate cancer research. We love all of the funny, upbeat, facial hair-growing campaigns we’ve seen over the past few weeks – they drive awareness for such an important cause. Prostate cancer itself is serious, of course. It’s the most common cancer for American men (along with skin cancer), with more than 241,000 new cases diagnosed every year. (And it’s the second leading cause of cancer death for men, behind lung cancer.) In 2012, more than 28,000 men will die from prostate cancer, according to the American Cancer Society. Prostate cancer is also close to our Foundation, as the JAF has supported seven individuals battling the disease with financial assistance in 2012. So, what can men do to prevent prostate cancer? Choose a healthy, low-fat diet: There’s some evidence a diet low in fat and full of fruits, vegetables and whole grains may decrease the risk of prostate cancer. Select leaner cuts of meat and choose low-fat or reduced-fat dairy products. And eat more plant-based fats than meat-based, substituting olive oil for butter, for instance. Fatty fish — such as salmon, sardines, tuna and trout — are also good, as they contain a fatty acid called omega-3 that has been linked to a reduced risk of prostate cancer. Reducing dairy products is also a good idea, as is drinking green tea and adding soy to your diet. Drink in moderation: Stick to no more than a drink or two per day. One study found that men who drank several drinks every day over many years had an increased risk of prostate cancer. Maintain a healthy weight: Men with a body mass index (BMI) of 30 or higher are considered obese and at higher risk of prostate cancer. Exercise most days of the week: Studies of exercise and prostate cancer risk have shown that men who exercise may have a reduced risk of prostate cancer. Exercise also reduces the risk of heart disease and other cancers. Talk to your doctor about your risk: Some men have an increased risk of prostate cancer and should consult with their doctors. While opinions on routine prostate cancer screenings differ – with some medical providers worrying about false-positives, over-diagnosis and overtreatment – high-risk men should consider screenings starting at age 40, the Mayo Clinic says. Those at a higher risk include those with a strong family history of prostate cancer and those whose ethnicity puts them at risk (African American men have the highest risk). Most of these recommendations apply to preventing other types of cancers, as well, and promoting general good health. So protect yourselves, men, and stay healthy!